Hidden deep in the rugged Sierra Tarahumara section of Mexico's vast Sierra Madre Occidental lie four stupendous gorges, all eventually funneling together to form a canyon system greater than the Grand Canyon of the Colorado. Although each canyon has its own proper name, the area has become famous as the Copper Canyon, and is viewed by thousands annually who take the train ride from Los Mochis to Chihuahua City. But how many people ever venture to know the canyons from within...? This vast wild land is as varied as it is big. The pine-clad sierras, lying at around 8000 feet above sea level, are cool and pleasant in the summer, and can be downright icy in the winter. Climate, vegetation and wildlife change rapidly as one descends into the canyons, whose narrow floors lie 4000 to 6000 feet below their rims. To take advantage of all the region offers, Skip McWIlliams operates two separate posadas: the Sierra Lodge in the cool of the mountains, and the Riverside Lodge in the bottom of Batopilas Canyon. The two lodges are as different as the two environments in which they are located. The Sierra Lodge is a rustic hotel of log construction, beside a mountain stream. But don't let rustication fool you: meals are gourmet quality and there's an open bar. Each evening the woodstove in your room is stoked up for you, and each morning you are brought a hot beverage-- coffee, tea, or steaming chocolate-- to ward off the nippy air. During the day you can hike an easy trail to nearby Cusarare Falls, where you will likely find young Tarahumara girls on hand weaving clever baskets out of pine needles, and, incidently, happy to sell you some of their handicrafts. You can also visit the Tarahumara mission town of Cusarare, go birding, or explore cliff dwellings not long abandoned. More ambitious hikes include an all day guided hike to hot springs, where a good hot soak is in order before starting back! The Sierra Lodge guides will offer you a variety of hikes to choose from, guided and unguided, and the chef will fix you a picnic lunch for the trail. After a stay of several days in the sierras, it's time for a complete change of ambience. So the Copper Canyon vans will take you and fellow guests of the Sierra Lodge across the ranges and down, down, twisting down into Batopilas Canyon. If you want the best views, and plenty of breeze, you can ride on top of the van in specially constructed seats, strapped in like a fighter pilot! And if we can believe the sign, the road gets really exciting! Past the old copper mine of La Bufa, the road eventually arrives at the Spanish colonial silver town of Batopilas. Here, in contrast to the log hotel in the mountains, you are lodged in old colonial-style buildings carefully and romantically remodeled into a hotel of grace and charm. The lodge stretches a block along the more important of Batopilas' two streets, with patios and gardens interspersed between the rooms. No two rooms are alike, and all are furnished with antiques and lit at night by the soft glow of kerosene lamps. As you will have come to expect, the cuisine at the Riverside Lodge is terrific, and the bar is well-stocked. The now-sleepy town of Batopilas originated as a Spanish colonial silver-mining town in 1709, and in the late 1800s was the site of a fabulous silver boom. A fascinating short excursion from the Riverside Lodge is a prowl of the ruins of Hacienda San Miguel, former home and company headquarters for an ex-governor of Washington, D. C. who moved his family here in the 1880s to become a silver magnate. For those wanting a more "in-depth" view of the mining history of Batopilas, a guided hike up the mountainside and into the abandoned Peñasquita Mine is highly recommended. You can still collect mineral samples from the veins cut by the mine drifts. But watch out for some of those shafts! There aren't any safeguards in this old mine, and OSHA is another world away! The hike no one should miss is the hike down Batopilas Canyon to Satevo, to visit the abandoned 18th-century Jesuit mission church, popularly known as the "Lost Cathedral". You'll never forget your first view of this romantic scene as you round a bend in the road, and there, framed in the distance, stands this most improbable church in the middle of nowhere! In addition to a great variety of hikes, the Riverside Lodge and Batopilas Canyon is a great place for bird watching. Hummingbirds and other feathered friends frequent the gardens of Riverside Lodge. Birds in tremendous variety inhabit the canyon. The Riverside Lodge's bird list includes more than 400 species! Among the showiest of the canyon birds are the beautiful trogons. All of these features and activities make a visit to the sierras and Batopilas a special experience for every visitor, but they are "par for the course" on Skip McWilliams' Copper Canyon trips. For something REALLY special, Skip himself occasionally leads a multi-day hike (one of "Skip's crazy hikes", as his staff are prone to say!) across mountains and canyons with Tarahumara porters. For further information on Skip McWilliams' hiking lodges, the facilities, scheduling details, and tour prices, we recommend you visit their extensive homepage. Then, if you would like to experience a Copper Canyon adventure, simply use your return button to come back to Rutahsa's website and e-mail us. By arrangement with Copper Canyon Lodges, Inc., Rutahsa Adventures can book your Copper Canyon trip at extra special prices. For a variety of other high quality travel adventures, see Rutahsa Adventures homepage. We first visited Copper Canyon in Aug. of 1964. 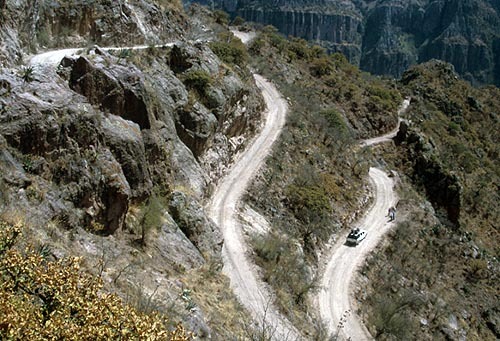 We didn't return until march of 1999, when we traveled on a Copper Canyon Lodges trip. Now we wonder why we waited so long to come back!